The external terrace is a recent addition to the rear of a substantial new dwelling attached to the back wall of the pool house. The terrace provides long views over the landscaped garden and countryside beyond and benefits from a large fixed seating area and external kitchen/barbecue. The terrace is perfectly positioned to benefit from all day sunshine. However, no thought had been given as to how to satisfactorily protect both the sitting and cooking functions of the terrace from the sun or indeed the rain. The family who live here enjoy making the most of their beautiful garden and its setting, meals outside and entertaining large groups of friends. We were therefore engaged to solve the problem as to how to extend the usability of the terrace past just warm, but not too sunny, summer daytime use. Our design should incorporate heating and lighting capabilities to allow night time use and should offer flexibility in the amount of cover provided to the terrace. It should maintain the terrace as a structure free zone so as not to require the complete redesign of the existing fixed seating and cooking areas and any supporting structure should not be visible from the rear ground floor accommodation of the house. The terrace is 6.5m long and 7.5m wide. 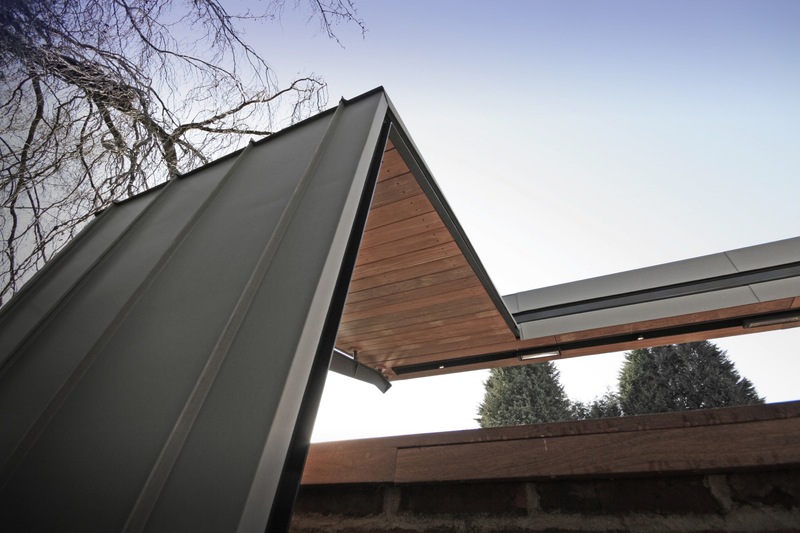 A single retractable awning fixed to the house could not satisfactorily cover the area. This meant introducing two awnings and therefore a structure to support them that could not be seen from the back of the main house and does not interrupt the stunning views from the terrace to the landscape beyond. A diagram was generated that split the terrace in two and allowed independent awnings to separately cover the seating area and the outdoor kitchen. One large awning could extend to cover the seating area and a smaller one to cover the outdoor kitchen. Each could be operated independently. 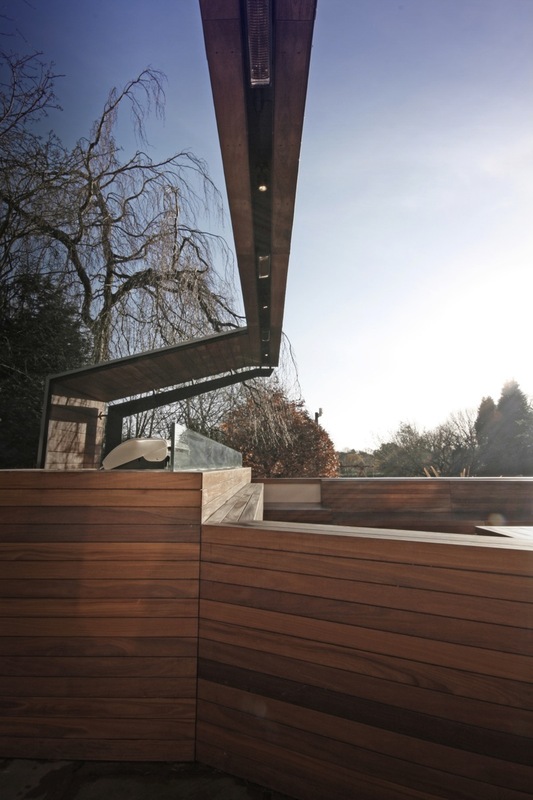 A beam was created and centred on one of the brick piers to the pool house formed from twin back-to-back steel channels. 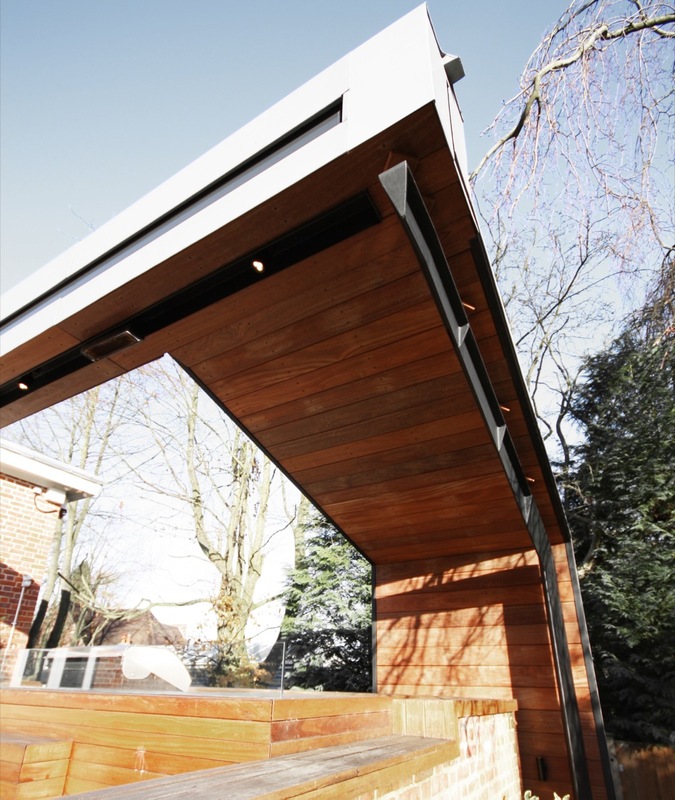 These channels, carrying the retractable awnings, are supported at the house end by the existing brick structure and at the garden end by a specially fabricated cranked triangular steel column. The delicate cranked arm of this column component holds aloft the end of the twin channels and by being cranked allows the vertical element to be positioned off the terrace itself. 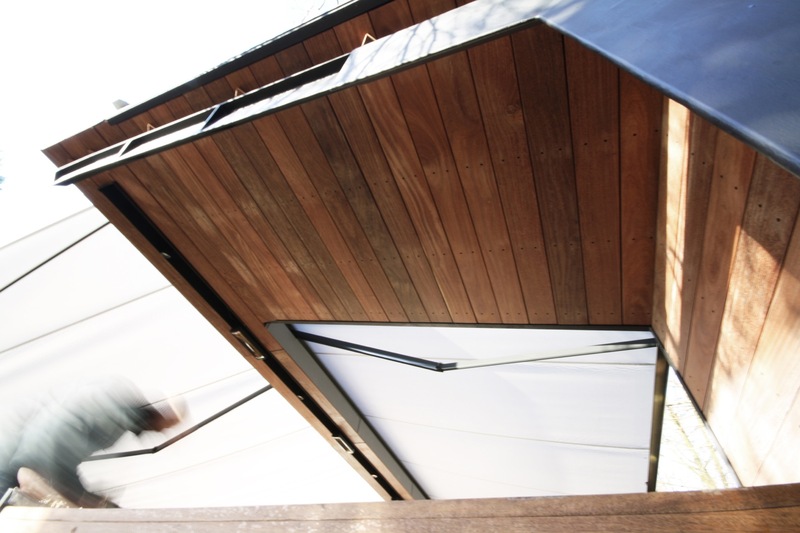 The steel channels are wrapped in pre-weathered zinc to compliment the adjacent metal roof to the pool house and under drawn in Cumaru hardwood to match the existing fixed furniture below them. A recessed channel runs the full length of the underside of the new overhead beam and provides a trough in which to mount the multi-directional LED lighting and infrared heating. 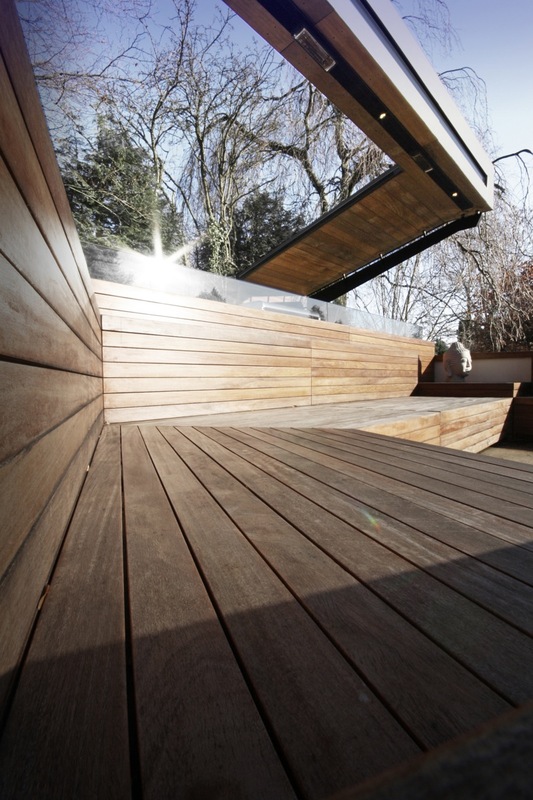 The new installation gives the existing outdoor space the feeling of being an outdoor room. The arrangement of the canopies provides ultimate flexibility via remote control operation and protect from both rain and UV radiation. They give the feeling of being inside outside.